This weeks’ post is, of course, all about CHRISTMAS. Whatever you are doing this year, wherever you are, wether you celebrate Christmas or not, wether you are surrounded by loved ones or are alone, may you count your blessings on this day and may you feel much love in your heart. Im away from my computer and on my iPad during this festive season, so apologies for any differences you may see from previous weeks. This is much easier on my desktop. Lol. This weeks prize is a surprise collage pack for the lucky winner. I will draw a random name on Friday 6th January from those who have uploaded into the Week 52 folder by that date. So you have two weeks to complete the challenge. Now it’s time to draw a name from the photos loaded up into the Week 50 photo album. Today’s lucky winner is Cath Young. Congratulations Cath. This is the beautiful page that Cath created. Beautiful. I’m trying so hard not to use all the stock that is arriving. I just want one of everything. 😁 Things haven’t gone according to plan, but I’ve had to accept that some things that are out of control and I have to accept it and go with it. I’m now hoping to open not long after Christmas. Not great timing for a business, but again, some things I have no control over. Just a reminder that if there is anything you would like to see in my store or something that you think most people would love, please let me know either by commenting on this post or emailing me at admin@luluart.com.au. Thank you so very much. Thank you to those who have already responded. I truly appreciate it and will do my best to stock what you like. Please PM or email me if you have an urgent questions. Would you love to be part of the Lulu Art Creative Design Team? Are you passionate about mixed media artwork? Do you look at art supplies like a child looks at candy? (I certainly do) Do you like trying new products? Do you have a blog, website or Facebook Page where you showcase your work? Send me an email to admin@luluart.com.au before Saturday 31st December. Include your name, where you live and a link to your blog. Attach some photos if there is anything in particular you’d like me to see. Tell me a bit about yourself and what you love to create. To create an art tutorial or short art video to showcase on the Lulu Art blog, as well as on your own social media sites. The frequency will vary depending on how many Design Team members I end up choosing, however it will be no more than once a month (as more often may be expecting too much). The tutorial must contain a good proportion of products available in our store. To take good photos of your work including some photos of the process steps and put together into a Youtube video (I can show you how to do this). To commit to being part of our team for the next 6 months. To have FUN and create whatever you want! I will give you a voucher each month to use towards products in the store. I will provide you with a Design Team/Lulu Art graphic to put in the sidebar of your blog stating you’re a Lulu Art Design Team member. I will promote you on my social media sites, including the Lulu Art blog and Facebook Page, whenever possible (and hope you will do the same .. win/win!). I will invite you to join a private Facebook group where the design team can chat amongst themselves and to me. If this sounds like something you’d like to be part of, please don’t hesitate to apply. It doesn’t matter if you’ve never been on a design team before. Give it a go! Get those entries in before Saturday 31st December. I would love it if you could share this with friends who you think might be interested. Let’s get the message out there. For any more information please contact me at admin@luluart.com.au. Looking forward to a fun and creative 2017. Wow. I can’t believe it’s nearly Christmas. I hope you are all organised for the Christmas festivities. I have yet to get started. =(. I’ve been so busy here behind the scenes, with stocking Lulu Art store, that I have not done a single thing for Christmas. Yes, I do need to pull my finger out and get a move on. This week’s quote is all about SHARING YOUR SOUL through Creativity. My creativity has suffered tremendously for the past month or more. I used to create every single day, without fail, so to say that I am in desperate need to CREATE, is an understatement. I get cranky when I don’t create regularly. Each time we create something we automatically put a piece of ourselves/our soul into our creations, wether we continuously decide to or not. It’s just what naturally happens. I hope you find time to share your soul this week. I will draw a random name on Friday 30th December from those who have uploaded into the Week 51 folder by that date. So you have two weeks to complete the challenge. Now it’s time to draw a name from the photos loaded up into the Week 49 photo album. Today’s lucky winner is Jennifer Lano. Congratulations Jennifer. 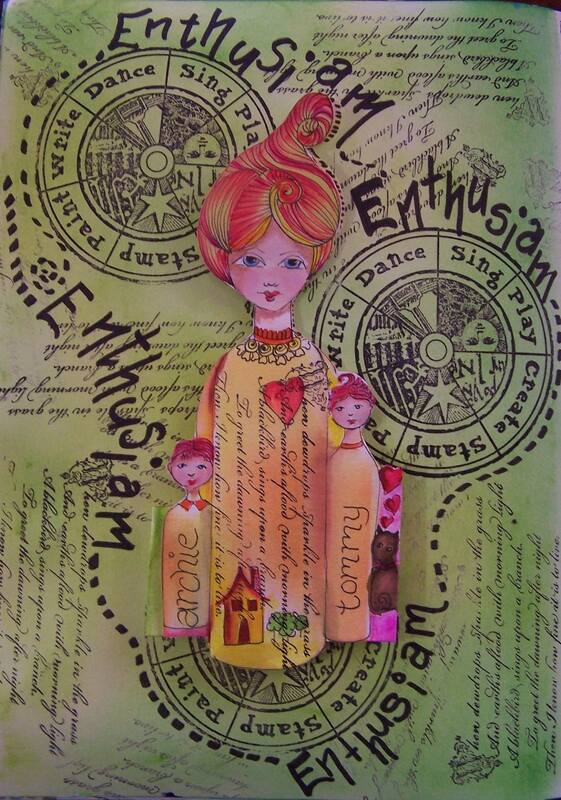 This is the beautiful page that Jennifer created for the theme BLOOM. How appropriate. Most of my base stock has arrived and I’m waiting to finalise a few things before re-opening. I’m so hoping to open in the next few days. My fingers are still crossed. I keep having this reoccurring thought that the store will open and I will never sell a thing. I guess being stuck with loads of scrumptious art supplies is every artist’s dream…….. I always look for the silver lining….he he he! 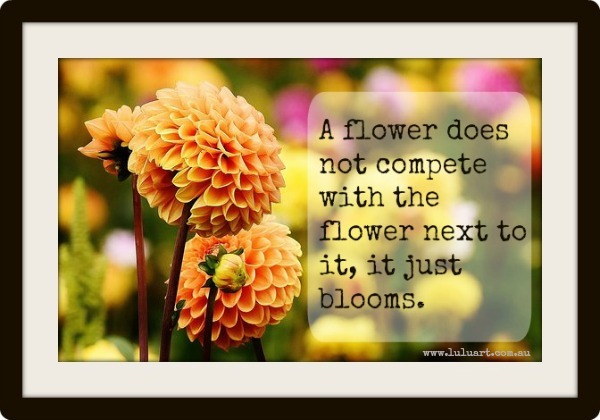 This week’s quote is all about the importance of not COMPETING or COMPARING yourself to others. We are all unique individuals and have so many different qualities. Same goes with our creative practice. We are all at different places of our own journeys, so it is crazy to compare yourself or your work to anyone else’s, not to mention how toxic this can be to your confidence and your flow of creativity. Imagine if we all created the same as each other and did it so perfectly. How boring would that be? Our imperfections and differences are what make us interesting. I would choose interesting over perfect every time. So Bloom I say, Bloom. Just a reminder that there is only 2 weeks left of the challenge, but we will continue on into 2017. I do plan on adding a few more humourous quotes into the challenge, as I believe laughter can truly change your day. I hope you all don’t mind that. We will draw a random name on Friday 16th December from those who have uploaded into the Week 50 folder by that date. So you have two weeks to complete the challenge. Now it’s time to draw a name from the photos loaded up into the Week 48 photo album. Today’s lucky winner is Laurie Maxwell. Congratulations Laurie. This is the lovely page that Laurie created. I’m still waiting for stock to arrive. Although I have had some stock arrive, it is no where enough to re-open the store just yet. It’s a shame as I was hoping to be open for anyone who wanted to do some Christmas shopping. My fingers are still crossed. If there is anything you would like to see in my store or something that you think most people would love, please let me know either by commenting on this post or emailing me at admin@luluart.com.au. Thank you so very much. This week’s quote is all about NEW BEGININGS and how exciting and life changing a new beginning can be. Embrace any new beginnings and let your life unfold. You are worth it. As I eagerly write my first Colour Me Positive post I can’t help to wonder what I’ve gotten myself in for. I am so happy to be taking over the reigns from Lisa, both in the CMP challenge site, surrounded by such a wonderful creative community that I’ve hear so much about and I’m even more excited about taking over Lulu Art Store. Adding both the CMP challenge and the Art Store to my repertoire of creative endeavours seems to be just an extension of the many things I already do as a mixed media artist, who enjoys inspiring others to create. 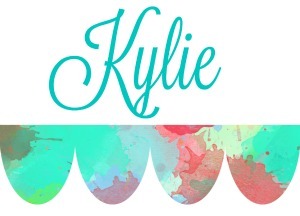 For now I will introduce myself as Kylie, a mixed media artist from Australia. I will introduce myself properly in the next post. I’m busy behind the scenes here, ordering and unpacking stock and updating the store. I will also let you know when LuluArt Store is fully stocked and is ready to send out yummy art supplies to you. I look forward to connecting with you all. I can’t wait to see what art journal pages you create based around new beginnings. We will draw a random name on Friday 16th December from those who have uploaded into the Week 49 folder by that date. So you have two weeks to complete the challenge. Now it’s time to draw a name from the photos loaded up into the Week 47 photo album. Today’s lucky winner is Vicki Phelps. Congratulations Vicki. This is the adorable page that Vicki created. This week’s quote is all about COMMUNITY and how we can all make a difference in peoples lives. We’ve also got some exciting news, so make sure you read on. I’m reminded today about the wonderful community we have built here and the support and encouragement that has happened over the course of the year. We have had gorgeous souls from right across the world, from all walks of life, participate in the challenge. Some of these have had some incredible challenges over the year and I’ve had many emails and private messages telling me how this challenge has helped them get through them either by expressing themselves, through the positive messages, or from the sense of community and encouragement they have received. I have to admit that at times reading these messages have brought on some happy tears. When I started the challenge, that was exactly what I wanted to achieve, I just never knew we would grow so big. I’d had friends go through a lot of tough things the previous year and wanted a place where people could come to switch off from that and be filled with positive messages and hope. I feel so completely humbled by the response we’ve had to this challenge. It was better than I ever imagined and I will never forget this experience. My big news this week is that I have sold my lovely art supply business and I’m moving on to other exciting adventures. I’m delighted to announce that the new owner has kindly agreed to take over running this much loved art journal challenge and will guide and nurture you from here on 🙂 You’ll be pleased to learn that she will be continuing the challenge in 2017. It may take on a slightly different format but it will be the same safe and supportive place to be creative. So this week is my last week authoring these blog posts and leading you in our challenge so I wanted to take this opportunity to thank you from the bottom of my heart. You have all been amazing, incredibly creative, and shared your artwork, your stories and your hearts. Thank you so much for taking part and supporting one another along the way. 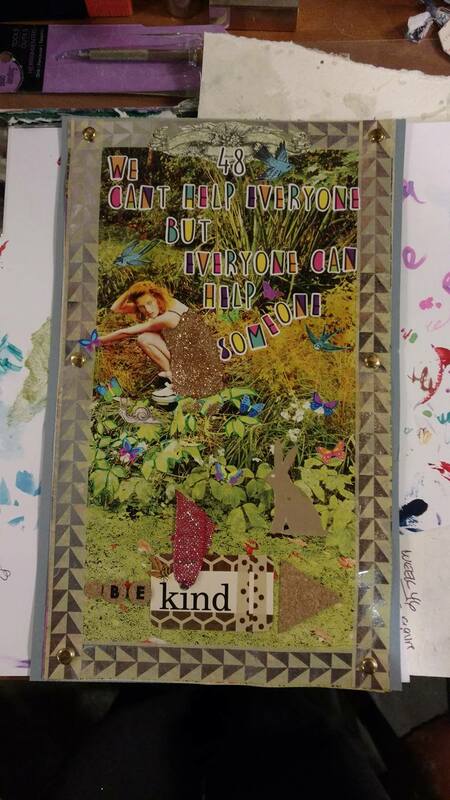 Looking forward to seeing what art journal pages you create based around community. We will draw a random name on Friday 9th December from those who have uploaded into the Week 48 folder by that date. So you have two weeks to complete the challenge. Now it’s time to draw a name from the photos loaded up into the Week 46 photo album. Today’s lucky winner is … Lisa David. Congratulations Lisa. This is the gorgeous colorful page that Lisa created.